Pistorius, the first double amputee to compete in the Olympics and Paralympics, appeared distraught as Roux read his comments and had to be asked to compose himself by chief magistrate Desmond Nair. "I didn't kill Reeva," read Pistorius’ statement. "I deny that I committed murder in the strongest point. I tried to save Reeva but she died in my arms. I can’t stand how much hurt I’ve caused. "I fail to understand how I could be charged with murder, let alone premeditated. I had no intention to kill my girlfriend." His version of the tragic events of the early hours of Valentine's Day morning were that he had left the bed he and Steenkamp shared to get fresh air on his balcony. According to the affidavit, as he came back inside he became aware of a noise from the bathroom, which he believed to be an intruder, and put on stumps instead of his prosthetic legs. Pistorius said he felt vulnerable without his prosthetics and was also worried because the window in the bathroom did not have burglar bars. After firing through the door, Pistorius claimed, he subsequently realized that Steenkamp was no longer in bed and the truth dawned on him that he had shot his girlfriend. 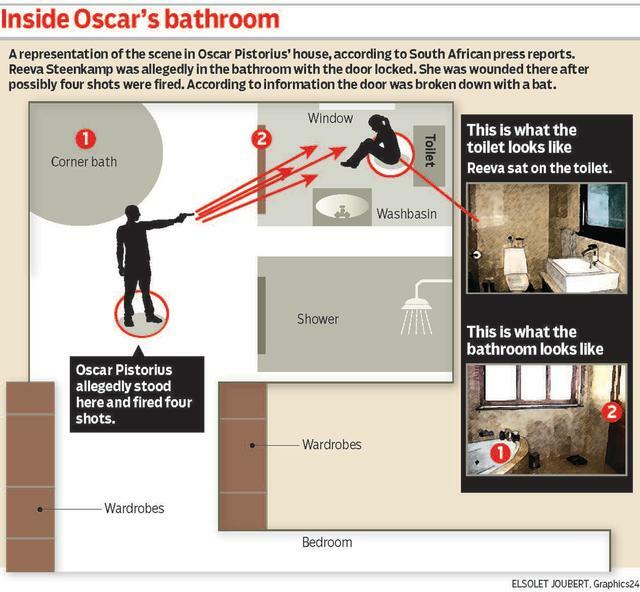 According to Pistorius, he broke down the door with a cricket bat and then telephoned for medical help. Pistorius' bail application was heard at Pretoria Magistrates Court in the light of a section 6 murder charge, the most serious available under South African law, and one that carries a requirement of premeditation. It means he is likely to remain incarcerated until he faces trial after prosecutor Gerrie Nel laid out the case against him, and Nair found that Pistorius will have to prove "exceptional circumstances" to have any chance of earning bail. The prosecution asserted an element of cold-blooded intent, putting forward that Pistorius had gotten up from his bed, put on some prosthetics and fired four shots through a locked bathroom door, three of which struck and killed the deceased. 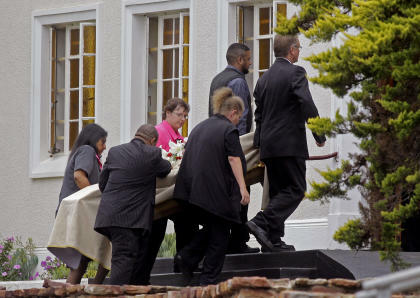 Meanwhile, 700 miles away in Port Elizabeth, Steenkamp was laid to rest in a small cremation ceremony involving members of her family and close friends, including South African international rugby star Francois Hougaard, who reportedly texted Steenkamp just before her death. While Steenkamp's family insisted they were trying to avoid all coverage of the Pistorius hearing, her friend, former professional jockey Gavin Venter, spoke out angrily. "[Pistorius] is a danger to the public, he will be a danger to witnesses, he must stay in jail," Venter told 567 Cape Talk radio. As the bail hearing got underway, a moment of pandemonium erupted in the halls outside the courtroom, as officials insisted only 26 journalists be allowed inside as more than 100 clamored to be among the chosen few. This mention is worthy because the South African media has already been a huge part of this sad tale, and make no mistake, will continue to be so. The nature of the South African judicial system, which abolished jury trials in 1969 at a time when that nation's tortured racial history was approaching breaking point, means that a single judge, perhaps accompanied by one or more technical experts, will decide Pistorius' case. That means that the typical media reporting restrictions that would be in place for a jury trial in the United States or most other legal jurisdictions based on the English common law system do not apply. In America, the kind of details that were reported over the past few days would not have been permitted under contempt of court regulations, for fear that its publication could influence the minds of potential jurors. Other snippets that have been relayed: Steenkamp was found in her nightwear, she had slept in the runner's bed (seemingly quashing the "intruder" defense) and that her iPad was found on Pistorius' bedroom floor. Other publications ran their own versions, with their own sources and their own details. But some of the details from different outlets conflicted – some reports have the first shot being fired inside Pistorius' bedroom, others say it was through the bathroom door – leaving the unedifying reality that some of the information disseminated to the public is false, while being reported as fact about a case that will determine one man's liberty and a young woman's justice. The pros and cons of this judicial approach divides even legal theorists – a heavyweight struggle between freedom of the press and the individual's right to a fair trial – but one thing is for certain: Oscar Pistorius can be thankful that this matter will be decided by one man because public opinion – influenced in no small part by the media "revelations" – has already presumed him guilty. "All I am saying is let him speak, let his side be heard without jumping to conclusions," Pistorius' former girlfriend Jenna Edkins tweeted on Saturday, though her account has not been verified. Later she added, "I would just like to say, I have dated Oscar on off for 5 YEARS, NOT ONCE has he EVER lifted a finger to me , made me fear for my life.."
Whatever your thoughts on Pistorius, innocent until proven guilty he is clearly not, at least not in the minds of the majority. The most salacious and, sadly, the most bloodthirsty verbiage will always garner the greater attention. Nothing coming from the Pistorius camp or any other means, like being ditched by Nike, could deflect from the report in City Press about that cricket bat allegedly recovered from Pistorius' luxury home in the Silver Lakes gated complex. Police cast doubt on City Press' source, but not necessarily the article's content, and in any case we will never know where the information truly emanated from. South African law protects publications from having to reveal their sources. On the flip side, the Pistorius camp has had its say, using its own entitlement for public persuasion allowed by the South African system. 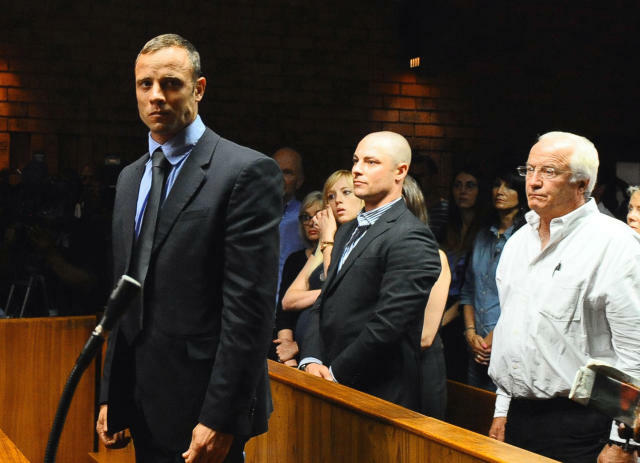 Pistorius was visibly full of grief at his preliminary hearing last Friday, shaking, gasping and bent over double in the dock. Yet either he or someone very close to him had the presence of mind to ensure that public relations guru Stuart Higgins had arrived in Pretoria from London less than 48 hours after Steenkamp was found dead. Higgins is a man well-versed in hard-fought public image campaigns, having waged them on both sides of the media divide, first as editor of top-selling British tabloid The Sun and then as an adviser to companies, sporting franchises, athletes and public figures in need of a shiny image makeover. Right now Higgins, who sat in the second row just behind Pistorius' father and brother during Tuesday's court proceeding, is merely in damage control mode and it may be that he is fighting an impossible battle. First there was Pistorius' uncle (not his legal team) issuing a firm denial of the premeditated murder charge, then his "best friend" Justin Divaris regaling Pistorius' anguish at the "accident," then the story that the runner would sue photographers over certain snapshots taken of him in court as they intruded into his grief. It all seemed to matter little when Steenkamp's mother June issued the following heart-wrenching comment to South Africa's Times newspaper: "Why my little girl? Why did this happen? Why did he do this?" And so the process continues and the frenzy will surely show little sign of abating between now and the trial. Meanwhile the conjecture will go on as to the fairness of the system, but it won't stop the public appetite for the tale of a superstar athlete potentially murdering his cover-girl lover, one that makes irresistible reading, viewing and listening for all but the most morally disciplined.